Self-driving cars are set for tests in San Diego's perfect weather. San Diego: the land of sunshine, palm trees, perfect tans—and now, cutting-edge autonomous vehicle (AV) research. The unrelenting revolution of driverless technology has prompted the need to test self-driving cars for general use by the public. America’s Finest City was just designated as one of the country’s few “proving grounds” for driverless vehicles. San Diego is one of ten sites chosen by the U.S. Department of Transportation (DOT) to collaborate and test the practicality of autonomous cars on public roads. San Diego’s application to become a U.S. DOT-sanctioned proving ground was jointly submitted by the San Diego Association of Governments (SANDAG), Caltrans, and the City of Chula Vista. The three entities, which also received support from a number of local organizations, will make a combined effort to oversee and run the project. “We are confident that the San Diego region will serve as an ideal proving ground for autonomous vehicles,” said Helen Gao, SANDAG’s Senior Public Information Officer. The proving grounds are meant to be an experimental setting, where the safety and technology of driverless cars can be examined across a variety of environments. With U.S. DOT-designated testing sites spanning the entire country, there’s no shortage of weather and terrain varietals. “This group will openly share best practices for the safe conduct of testing and operations as they are developed, enabling the participants and the general public to learn at a faster rate,” Anthony Foxx, former U.S. Transportation Secretary, said in a press release. The end goal is to create a well-connected learning network that outlives the pilot program. The methods of communication in the future will be modeled after the collaborative efforts of U.S. DOT’s initial proving ground picks. Ability to formulate safe testing plans. Capability to share and compare collected data with other proving grounds. Continued abidance with local laws, policies, and regulations. 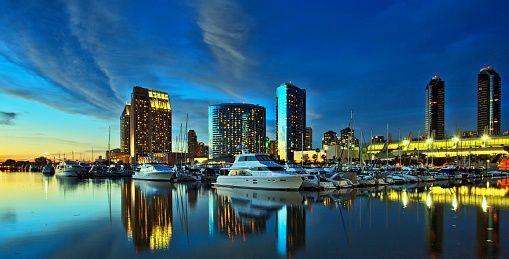 On top of meeting the above requirements, San Diego already has experience working with the U.S. DOT on groundbreaking projects. In 2010, San Diego was just one of two cities in the nation selected to participate in the Integrated Corridor Management (ICM) project. More notably, in 1997 San Diego hosted a demonstration of what an automated highway system (AHS) could look like. The demonstration included 1,350 cars, each of which featured an earlier version of the driverless capabilities we’ve become used to seeing today. The 1997 AHS program didn’t take off, though. At the time, the concept and cost of self-driving cars seemed better suited for a fictional world. Fighting a lack of funds and faith, the available AV technology of 1997 didn’t allow for much progress. However, the AHS demonstration was pivotal in laying the groundwork for continued research in the realm of AVs. Now, 20 years later, with engineering and software made specifically for driverless cars, San Diego is ready to give self-driving vehicles their second chance. “Manufacturers who wish to test their products here will have access to global leaders in the cybersecurity and wireless industries, as well as academic institutions at the forefront of robotics research and development,” Gao said. Private car companies and public transportation agencies wishing to test their autonomous vehicles will be well-equipped in San Diego. The city agencies supervising the proving grounds will work directly with automakers and suppliers, solidifying the impact of all learnings during the project. Elaine Chao, the current U.S. Transportation Secretary, says she intends to support the continued growth of the autonomous vehicle industry. The pilot program could be the final push towards getting a majority of the general public in self-driving vehicles, a move which many major players in the auto industry anticipate. As San Diego takes the wheel on the U.S. DOT’s pilot program, we can all start to feel our grip loosen; as a leader in the autonomous vehicle movement, San Diego will assist in steering us towards a well-connected, self-driving future.